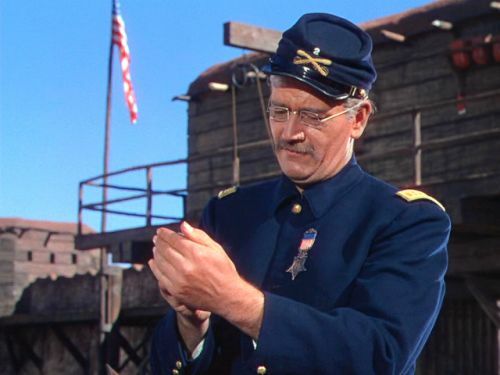 SHE WORE A YELLOW RIBBON is a well-mounted, fondly recalled 1949 John Ford western, simply great to look at, but so steeped in sentimentality that if you squeezed it hard enough you’d strain out a couple Imperial gallons of Irish whiskey. Little action in this, the second in what’s always rather lazily referred to as “the cavalry trilogy”, bracketed by Fort Apache and Rio Grande ( the trio came out over a 3-year span, but you could just as well extend the courtesy and make it a sextet with The Horse Soldiers, Sergeant Rutledge and Cheyenne Autumn). Mainly it’s a character study of an aging captain (John Wayne), on his last mission before retirement. In the wake of the 1876 Custer debacle, aside from confounding the warpath-bound tribes, the veteran ‘Captain Nathan Brittles’, mulling his life after the army, chatting to his wife’s gravestone in the post cemetery, has to nursemaid some fresh lieutenants (John Agar and Harry Carey, Jr.), who are both in heat over a spunky army brat (Joanne Dru). 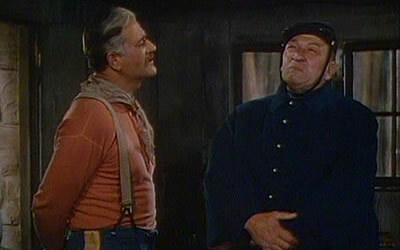 He also has to humor his loyal noncoms, Ben Johnson as ‘Sgt.Tyree’ and Victor McLaglen as ‘Sgt.Quincannon’. Did anyone named ‘Quincannon’ ever exist outside a John Ford western? Tried & true, with most of the comic and romantic relief silly and annoying instead of engaging or affecting. Richard Hageman’s score really plows in the noisy nostalgia. But Wayne looks great, made up to pass as a man twenty years older (he was 41), and gives a warm, full-bodied, honest and dignified performance that he often mentioned as his best. He was nominated that same year for his hardcase Stryker in Sands Of Iwo Jima, but felt he deserved it more for this kinder, mellower, more introspective role. He remains, rest assured, fully In Command. Me-self, strong as he is here, I’d be favorin’ Duke in another of his five from ’49, Master Ford’s Three Godfathers. 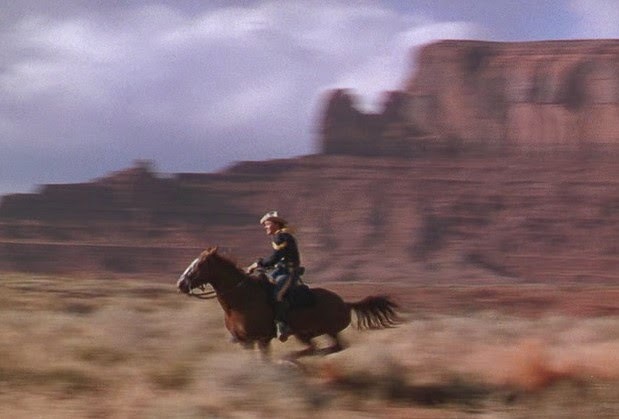 Ford’s affection for the romantic mythology of the horse soldier, (a lot of which he effectively created), his bygone world and the awesome landscapes he patrolled are framed by cinematographer Winton C. Hoch in richest Technicolor, making the most of the majesty of Monument Valley. “Pappy” instructed Hoch “I want Remington color.” The shots of the proverbial “column of two’s” riding over the red earth, monoliths in the background, while black clouds of a lightning storm sweep in are Americana treasures. They were a break—both lucky and dangerous– to capture on camera for that memorable scene, when the gale blew up suddenly. Everyone got nervous because the metal on bridles and saddles could conduct electricity, but Ford was adamant, Hoch aced the shots, and and was awarded an Oscar for his work. The farewell patrol runs 103 minutes, co-stars Mildred Natwick, George O’Brien, Arthur Shields and Tom Tyler. In small parts are Ford regulars Chief John Big Tree, Jack Pennick, Fred Graham, Francis Ford and Mickey Simpson. The ever-present bugler is feisty Frank McGrath, who later found fame and fans playing cantankerous chuckwagon cook ‘Charlie Wooster’ in 271 episodes of Wagon Train. The now-sappy narration was done by Irving Pichel. Ford and his writers Frank S. Nugent and Laurence Stallings took elements from two short stories by James Warner Bellah, but worked mostly off a free-flowing memo Ford wrote outlining what amounts to a visual poem, an elegy to aging, a salute to tradition. He shot quickly and economically; knowing just what he wanted he was effectively editing in camera. He brought it in with just 31 days of shooting and well under the budgeted $1,800,000.